Many different types of ignition have been introduced over the years Pul-Byar, Poronsan, Mato Plat and others, all for older machines. Most have been fairly successful and are in use today, but like many other parts seem for some reason to become extinct or out of date. Electronic ignitions are like other things in life, they need constantly looking at, to find ways to improve.Having used most of the above makes on machines over the years and with problems of importing ignitions, we felt it was time to build our own system and give you a British product that carries a full warranty. The current system we have available will fit Villiers Alpha Crank Shafts and can be used with or without a flywheel. We set about building a simple system at first, but with some advance built in to it. Our new electronic system uses a Pul HT coil at the moment with a built in CDI, but we intend very shortly to produce our own coil. Simply by removing the Villiers flywheel and removing the centre boss and magnets you are ready to fit the rotor. This bolts in the back of the flywheel in any position. The rotor is keywayed to fit the crankshaft. Next step is to remove coils from backplate. Replace the coils with a new internal backplate which picks up on coil screws.The new backplate retains the stator ring and stator. This can be adjusted so timing the system is very easy. When stator and backplate have been fitted run the wires up to the HT coil, through cover. This can be mounted under the tank or seat whichever is most convenient. Connect the spade end terminals on the coil, connect the plug and you are ready to fire up the bike. Timing can be from 1.5mm to 3.5mm TDC. The small hole in the stator backplate should line up the small hole in the flywheel. 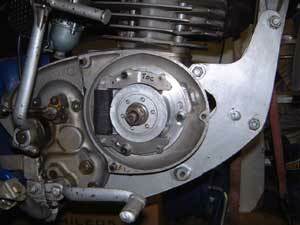 the stator can be finally tightened and likewise the flywheel, after adjustment has taken place. The system has no lighting at the moment and is suitable for Trials, Moto X and Road Racing. Other systems for Tiger Cub - BSA - Triumph Twins are being worked on, together with a 12 volt lighting ignition for single and twin spark machines. This is anticipated in about six months. This system can be fitted in a little over two hours. It comes complete with stator plate, outer cover, 3kg flywheel, stator system, CDI box, coil and fixing screws. It is available with or without lighting coils. The electronic system will fit Villiers and Alpha cranks. Suitable for 9E and up to 37A engines. We also offer a fitting service for those who do not wish to tackle the job themselves. This transforms your old machine with this new century technology for reliability and peace of mind. Here are a few comments we have received from satisfied customers. "The bike feels like new"- Terry Sewell of Corringham. "The bike performs better than my 1969 Butaco"-Jes Kane, Classic Motorcycle. "I rode the Greeves all day today-,she never missed a beat, unlike the old system which failed miserably"- Steve Brown of Wickford, Essex. I can tackle sections with this system that I dare not with the old system"- Dave of Fife, Scotland. 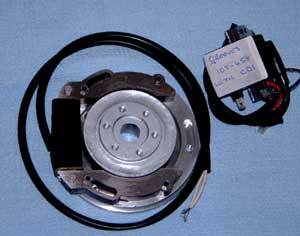 An electronic ignition system is also available for race bikes. Fitted to Greeves Silverstone and Oulton machines, this system does not have a flywheel like our trials version. The stator is mounted on a new back ring which in turn is mounted in the existing stator housing after first removing all the old coils. A new backplate can be provided if required. The old outer cover requires machining inside if a new cover is not fitted. Our new fibreglass or aluminium covers available. The system has retard built into it so the ignition is always set to correspond with peak revs.The self generating system can be fitted to Tiger Cub and BSA B41. Electronic Ignition is also available for Motocross, Griffon, Challenger and Hawkstone machines.